A new company, known as "Super Dimension 70", has recently been creating some attention for itself in the Hollywood community, with a "new, improved" 70mm presentation process. In a nutshell, what they are proposing (and demonstrating) is 70mm film, with the usual aspect ratio, run at 48 frames per second. The system uses a custom designed projector, the key feature of which is a pair of two intermittent movements, one at the top and one at the bottom of the projection gate. They are precisely aligned and synchronized, and help each other move the film through the gate at the necessary increased speed. They have made a demonstration film, similar in execution to the "Cinespace 70" demonstration film, introduced and narrated by American television newsman Walter Cronkite (the way Lowell Thomas introduced Cinerama many years ago.) It features samples of scenic shots, including aerial (helicopter) views over typically impressive western vistas. The system is presently installed at the "Harmony Gold" theatre (a pre-view and screening theatre) in Los Angeles, where it is being demonstrated occasionally to interested parties. They hope to persuade someone into producing a new feature in the process. This is the IMPACT, SDS-70 projector and platter that holds 32,000 feet of 70mm for 2hr and 20min. of running time at 48fps. The Digitally controlled transport insures pinregistered picture stability while exhibiting each frame twice for 96 refresh displays totally eliminating flicker. A Digital 8 track uncompressed sound repoducer follows in sync with the film via time code view and screening theatre) in Los Angeles, where it is being demonstrated occasionally to interested parties. They hope to persuade someone into producing a new feature in the process. "Redefining the Movie Going Experience"
Super Vista Corporation licenses and supplies its proprietary technology Super Dimension-70 (SDS-70) system, which presents to the film entertainment industry a revolutionary new leading edge motion picture process. The company owns patent rights to its breakthrough motion picture system for the production and exhibition of feature length films. The SDS-70 process was conceived and developed by Robert C Weisgerber, President of Super Vista Corporation. The patents are for a method that imparts both high-impact cinematic and conventional images on the same strip of film. The result immerses the audience as if they are part of the movie drawing them into the depths of the screen. This technology allows filmmakers the opportunity to take their creative vision to a new plateau. The recent success of both "Everest" ($100 million gross) and Disney's "Fantasia/2000" in IMAX ($60 million in 120 days), proves that large format films can draw huge audiences willing to pay extra to see and experience an event movie. Super Dimension-70 now for the first time makes available to filmmakers the ability to enter this lucrative market with full-length, large format event motion pictures. Super Vista Corporation is a full service organization providing the film industry the tools to create, produce, post-produce and exhibit SDS-70 feature length motion pictures. The company licenses the SDS-70 process from photographic to projection equipment and also provides full service design, installation and maintenance of the SDS-70 Impact theater technology. Super Vista Corporation has agreements with major cinema suppliers for key components of the SDS-70 system. Channels: 8 channel uncompressed digital. Illustration below (from a Showscan brochure) shows how an SDS theatre looks like. Theatres are more or less the same. Projector built by STRONG. Lens by Isco. Demo SDS film narrated by Walter Cronkite. 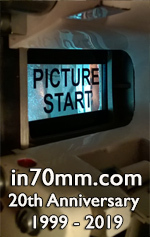 * Super Dimension-70 (SDS-70) is a patented and trademarked process employing advanced film based 70mm technology. * SDS-70 projects film at 48 frames per second. This frame rate closely replicates the way we see real life. When projected, each frame is presented twice, resulting in an exhibition display of 96 images per second. For films shown in this manner there is no projection flicker at any illumination level. * The intensified sense of reality produced by SDS-70 allows the audience to believe that the screen has disappeared and the viewer is drawn into the picture. * SDS-70 image quality surpasses that of all prior theatrical film systems. * SDS-70 presentations deliver high impact, immersively stunning images that are unrivalled in commercial cinema exhibition. * A feature film director employing SDS-70 can tell a cinematic story without compromise. * When CGI is employed the effects are enhanced and become part of the immersive experience. * Aside from requiring additional 65/70mm film stock because more frames are exposed, production costs are basically on par with conventional filmmaking. * Conventional 35mm, 24 frame prints can be extracted from the SDS-70 laboratory master making very wide distribution possible. Films produced in SDS-70 yield high-resolution pictures when converted to standard film formats. * No costly theater construction is required to facilitate SDS-70. * The SDS-70 projection system can fit into any normal size projection booth. * Standard 35mm and 70mm 24 frame motion pictures can be re-purposed for SDS-70 projection allowing for superior image and higher illumination levels. * Previously released feature films can be converted to the SDS-70 exhibition system renewing their theatrical exhibition life. * SDS-70 displays more than double the image information presented with conventional films and almost six times the image area of the standard 35mm wide screen frame. 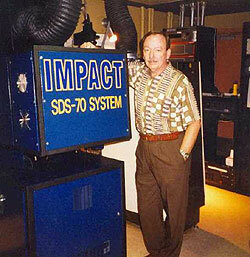 * The patented SDS-70 Impact Projector incorporates a "rock steady" movement. There is no perceivable jump or weave on the screen. In addition, no parts of the projection system come in contact with the image area of the film, substantially reducing dirt and scratch artifacts. * SDS-70 screen quality is significantly superior to digital cinema. SDS-70 prints have in excess of 22 million pixels per frame compared to only 1.3 million pixels in current DLP cinema. * Projection lamps of up to 10kW can be used. Screen illumination of more than 20 Foot-Lamberts can be achieved without projection flicker. * The projection technology is best suited for screen sizes between 50ft. and 80ft. Curved or flat screens can be used with a moderate radius being the preference. However, it is recommended that the screens be as large as the theatre can accommodate. * The SDS-70 platter system provides for more than 2 hrs. and 20 min. of uninterrupted screening. 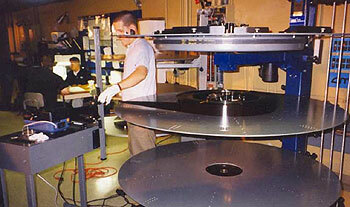 The platter can accommodate two complete SDS-70 feature films. * Eight channel uncompressed digital sound is incorporated into the SDS-70 presentation through the use of a double system hard drive reproducer. * Standard definition or digital high definition video transfers can be made from SDS-70 film masters.